Reserve A Cozy Cabin Today! This is our third time staying in the Arrowhead subdivision and 1st time at A Cozy Cabin. No complaints at all. Kitchen was very functional and well stocked. The jets on the hot tub don't work but it wasn't a big deal for us. We will definitely consider this cabin again! la Cabaña no estaba tan limpia, los balcones, las puertas, la vajilla, faltaban cosas en la cocina para que sea más Funcional, faltaban juegos de esparcimiento. Great place! Could use a few more tv channels or a listing of the available channels, wasn't really there to watch tv but would been nice to have when I tried. Could use a return text confirmation on check out. We loved our stay! Everything very clean. Only downside was that the upstairs bedroom mattress is broken in and needs replaced. We will stay again soon. Cabin was nice, clean. And it was cozy! Television cable was terrible. I don’t want to pay to watch tv on vacation. Checking out by phone should be included in your online packet to renters with a dedicated phone number. We left Sunday morning and I got no answer at any number I tried for over an hour. Finally someone answered at what she said was an “emergency” number but then said she would check me out. I recommend you have a line dedicated to check out where a message can be left if there is not a person available to take checkout calls. Frustrating when you’re trying to leave but can’t get officially checked out. Love coming to the Smokies! 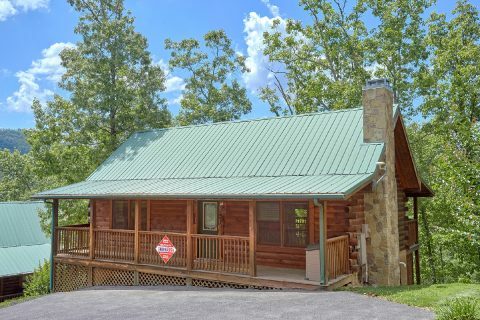 This is our third time staying in the Pigeon Forge/ Gatlinburg area with Cabins USA and all of our experiences have been have been favorable, however our stay in this particular cabin was hands down the best. The cabin was very clean, cozy and had plenty of room. It is far enough away from town to enjoy some much needed quiet and relaxation but only minutes away from some great activities in the area (very easy to find). The staff did an excellent job helping us check in and out and were very helpful with some questions we had during our stay. We have only been home for two days and we are already planning our next trip to stay in this cabin. Very excited to come back! My wife and i took my elderly parents to Pigeon Forge to see Winterfest Lights. We stayed at A Cozy Cabin in the Arrowhead Resort. The cabin was clean and furniture was comfortable. We found everything to be just like pictures and description indicated. It was nice to have bedroom, living room and kitchen on ground level with second bedroom downstairs. The reservation process at Cabins USA was very easy and staff was friendly. We would recommend thus cabin and will use Cabins USA again. The cabin was way too close to other cabins! No privacy! Anthe lock on the front door stuck two times which was bad! But management did take care of it for me. Thanks!! We loved the cabin with the exception of a couple of things. The amenities show that there are two queen beds. The beds were not queen-size, but doubles. The mattress upstairs was entirely too soft, at least for us. This is the third year we've stayed in that particular community, but the first time in this cabin. We will book again in the future. Check in was a little difficult because the doorknob was broken, we hat do wait outside in the head on repairman for about 15 minutes. The maintenance man Lexi arrived and had us in quickly and was so very helpful with anything we needed, very professional. Really great stay, very impressed with cleaning staff and maintenance! Truly a cozy cabin, only complaint was upstairs bed sank toward the middle and the hot tub didnt work, but the place was beautiful and COZY, overall and we had a great time. Thank you for taking the time to let us know about your recent stay in A Cozy Cabin! We here at Cabins USA strive to give each of our guests the best stay possible while vacationing in the Smokies. I apologize for the issues you experienced with the bed and hot tub. Your comments have been forwarded to our maintenance department to be addressed. When you are ready to stay with us again, please mention you are a return guest for an additional discount. Thank you again for your review and thank you for choosing Cabins USA! This cabin was much more than we expected for a two bedroom. There was a living room, bedroom, bathroom, jecuzzi, and decks ... on BOTH levels of the cabin. Full kitchen on top level, mini fridge and extra sink on bottom level. Half of the top deck is screened in with a table and chairs for eating outside if desired. The cabin was very roomy, very clean and very comfy. Two couples could stay here very easily, with lots of privacy. Highly recommend. We plan to come again very soon. My new favorite cabin in the Smoky mountains. Great cabin at a great price. Easiest check in of any place I've ever used. Cabin was all that we expected. Very clean. Beds very comfortable. Had everything we needed. Nice hot tub. Nice view. Would stay again. Very reasonable pricing, compared to many other cabins. Great value for your money!! I am so happy to hear that you enjoyed your stay in A Cozy Cabin! We here at Cabins USA strive to give each of our guests the best stay possible while vacationing in the Smokies. When you are ready to stay with us again, please mention you are a return guest for an additional discount. Thank you for choosing Cabins USA and we look forward to having you as our guest again! First time staying here and we were not disappointed. We will be back. We had a few issues at first with things not working but maintenance was on it quickly and efficiently. Thanks for an awesome stay! Love this cabin. Told husband if we get a spot on the lake I wanted this cabin. Let's see the tv wasn't even turned on cause we talked and enjoyed our friends so much. And yes I would rent this one again Loved the screened back part with table. We had an unexpected problem come up with the water & sewer but as soon as we called the problem in, the maintenance crew came running to fix it! In the end, we had to move to a different cabin (Sugar & Spice) & OMG, it was so luxurious & beautiful that it made up for all the other issues! My family has stayed with Cabins USA several times & they continue to impress me! I absolutely recommend Cabins USA to anyone looking for a great place to stay while on vacation!